...so before rushing to visit the most popular regions why not think about somewhere else for a change? You can avoid the crowds and still have a great time discovering the 'real' France! Our France regional travel guides feature hundreds of the most scenic, interesting and picturesque places to visit in all parts of France to help you better plan your visit. The most popular French regions with visitors include Brittany, the Dordogne and the Cote d'Azur (along with the rest of Provence), and of course and many tourists like to visit Paris. France This Way has a simple goal - to introduce the most picturesque, the most scenic, and the most interesting places to visit in France. To start to explore simply choose a French region or place above or on the map of France further down, then visit the travel guide for that region. Each regional travel guide has its own detailed map to help you see locate and learn more about the places in France that interest you. see Alsace Travel Guide to visit the Alsace. see Auvergne Travel Guide to visit Auvergne. see Brittany Travel Guide and Brittany seaside and coast to visit Brittany. see Burgundy travel guide to visit Burgundy. see Champagne Travel Guide to visit Champagne. see Corsica Travel Guide to visit Corsica. 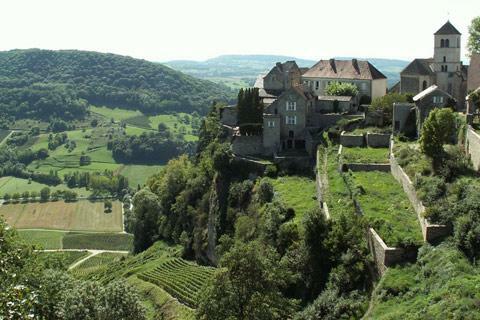 Franche-Comte is found to the east of France - the region borders onto Switzerland. As you head towards the east of the region you start to leave the rolling countryside and smaller peaks of the Jura mountains, cross the high plateaux, and enter the Alps 'proper' Much of the countryside is an unspoiled mix of forests and open country, interspersed with lakes and rivers...visitors come to Franche-Comté for the unspoiled and dramatic scenery as well as the pretty villages, lakes and numerous outdoor leisure opportunities. see Limousin Travel Guide to visit Limousin. see Lorraine Travel Guide to visit Lorraine. The Pyrenees are found along the border between France and Spain, and the Midi-Pyrenees region covers the middle section of the area. The Midi-Pyrenees region reaches from the Spanish border to the south and a long way north into areas that are quite remote from the Pyrenees mountains themselves eg Rocamadour in the Lot Department...visitors to the south will discover the spectacular mountain scenery while those further north will discover lovely villages and towns, and less mountainous but still very attractive countryside! There is one principal attraction that the Calais region is famous for - the battlefields and cemeteries of the WWI battles. Between Amiens and Lille, the Somme battlefields are still a major pilgrimage destination, and some of the Somme trenches are kept intact to help the visitor better understand the battles and conditions that were faced...although often visited for these commemorative destinations you will also discover other places of interest in Calais! 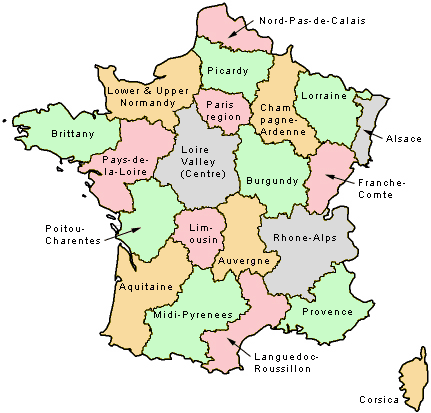 Poitou-Charentes is found half way up the western side of France, fronting the Atlantic Ocean / bay of Biscay. The capital of the region is Poitiers. The coastal region is said to be the second sunniest region of France (after Provence)...the principal attractions for visitors are the resorts along the coast, the beaches and villages on the Ile de Ré, and the historic town of La Rochelle. see Poitou-Charentes Travel Guide to visit Poitou-Charentes. 1) Select a region to see various information about many of the places to visit in France. These include for each region the villages that have received the accolade 'most beautiful villages in France', the sites listed as world heritage sites by UNESCO, and many of the other places and highlights. 2) If you know what department you want to visit, but not which region it falls in (eg Dordogne is a department, not a region), see the departments of France which lists the departments and shows which region they fall in. 3) If you know the name of a place in France you want to visit, but not the department or region it falls in, use the index! (see bottom of each page) - to find it within the site as a whole. Please do spend some time exploring the different places in France in this section - there are more than 1000 towns, castles and villages listed, and much more, most with photos. Somewhere we've missed? Let us know, so that our France Travel Guide is as complete as possible!